and rushed into the construction of commercial ice plants. 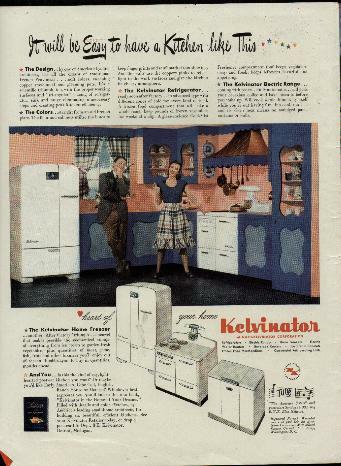 was changed to the Kelvinator Company. 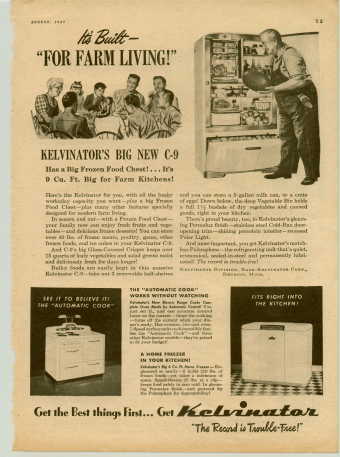 That year, Kelvinator refregerating units were installed in many of the finest homes of the Detroit area. more Leonard boxes than in any other kind, and developed a close working relationship. system, compressor and condenser installed in one cabinet. The public's favorable response to this "unitized"
marketed under the time-honored trade name, Leonard. elevating ice cream from a delicatessen and drug store specialy to a food staple now a part of every family diet. moves expanded the company's markets. directors to acquire stock in Ranco, Inc., from which they were buying thermostatic controls. president of the dual operation. Road is a quotation from Lord Kelvin which tells the Kelvinator story in a few words: "I've found a better way." atop a cake of ice in an ice box. The penalty: melted ice, a spilled pail and an unpleasant, difficult cleaning job. that was to grow rapidly into the country's foremost manufacturer of ice-refigerators. in 1889; front-opening ice chamber in 1893; porcelain-lined interiors in 1907.
creations of the Gay Nineties were a sight to behold. one of every five ice-refrigerators built in the U.S. -- 1,000 daily. 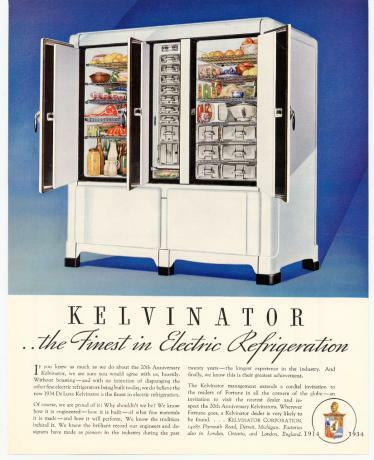 In 1926, the company merged with the Kelvinator Corporation. exclusive Leonard dealers in the U.S., overseas, and with the company's Canadian and English appliance subsidiaries. freeing of American women from the drudgery of washday. washing action. For power it was connected by belt to a gasoline engine. were delighted, but you could hear the groans of washboard manufacturers echoing from the Alleghenies to the Rockies. put on demonstrations for farm housewives in the shade of the big trees. And the washers sold--in hot-cake fashion! each year after that, until the old school house became to cramped for efficient operations. type" washers to the cylinder, the oscillator, the vacuum cup, and the reversing agitator types. In 1926 ABC erected the first porcelain plant in the industry, and introduced the first full line of porcelain tub washers. lines while developing cost-and time-saving methods, and expanding its market until it reached around the globe. But there still was another challenge to be met, a new field to be explored. which firmly entrenched the company as a major factor in this new field. first position - in Canada; second in the overseas market, and third in England. In certain areas, it is the established leader. and dispatch calls for modern equipment; to rob the stifling heat and humidity of summer of their horror call for the modern help of air conditioning. Collectively, these appurtenances of today's good life represent a monumental product volume ... and the market expands as the habit of usage grows. areas and its effect on private home construction, which is proceeding at a pace of well over a million units a year. all give impetus to the forward march of the major appliance business. the industry with such new and exclusinve features as removable and disposable oven-linings, which practically ended the difficult job of oven cleaning. available in eight different pastel tints as well as conventional white. household laundry equipment sales is, in fact, one of the brightest spots in the appliance picture. time-saving benefits, has been a great factor in increasing demand. home freezer industry, is steadily advancing its sale of room air conditioners and is marketing a distinctive and exclusive line of kitchen cabinets and cabinet sinks. Other domestic products, which collectively represent a substantial volume opportunity for the corporation, are water heaters, garbage disposers and dehumidifiers. scores of other specialized items. group called Export and Subsidiaries Division. Motors Corporation and centrally supervised. 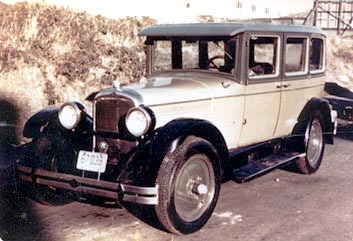 bodies and parts were manufactured in the company's Wisconsin plants and shipped to the Canadian plant for assembly, painting and trim. production was not begun until 1949.
that many more Nash automobiles will find buyers in Canada. parent company in the United States. manufacturing and selling rights with Vendo Company, makers of Coca-Cola dispensers; and the Fillery vacuum cleaner and floor polishers. types of equipment; and Northern Electric Company, one of Canada's largest national distributors of Leonard and other lines of appliances. Nash-Kelvinator Limited, England, a totally owned subsidiary of American Motors Corporation, ranks as the second largest appliance manufacturer in the overseas market. appliances are manufactured by big, locally-owned Kelvinator of Ausatralia, on a license basis. case of trolley trouble and "close" again when troubles were cleared. of these units. Thus was formed the Automatic Reclosing Circuit Breaker Company. In 1928, another opportunity presented itself for supplying a much needed control for electrical refrigerators in a simple and inexpensive form for this expanding industry. George W. Mason, then president of Kelvinator Corporation, launched Raney in this business by giving the first quantity production order for these controls. All told, Ranco has sold more than 75 million units in the U.S.A. alone, many thousands more from its subsidiary in Scotland, formed in 1950.
of all temperature controls in the domestic and commercial refrigeration industries. be the financing services of such companies as Refrigeration Discount Corporation (ReDisCo). beyond dealer financing to include the dealer's customers who were unable either pay cash or find other means of financing their purchases of the costly, early refrigerator models. been to the sale of motor cars. states, Canada, Puerto Rico, Hawaii, and Alaska. Over this area, ReDisCo has at one time served as many as 5,000 dealer accounts and over 300,000 individuals. less, such as temperature control knobs, washing machine dails and hydromatic gear knobs -- through a gamut of sizes for molding in maximums of 16, 28, 40, 60, and even 200 ounces. employs an advanced and exclusive process originated and perfected by American Motors plastic engineers. mold. The exactness, speed and control of the feed result in a strength, uniformity and perfection in the finished part and a production speed and low-cost never before attained. products for the Automotive and Appliance Divisions. plants in accordance with the company's program for streamlined and integrated manufacturing. defense contracts with a view to increasing the revenue from this source. engaged in the consturction of fuselage and wing sections for air force bombers.